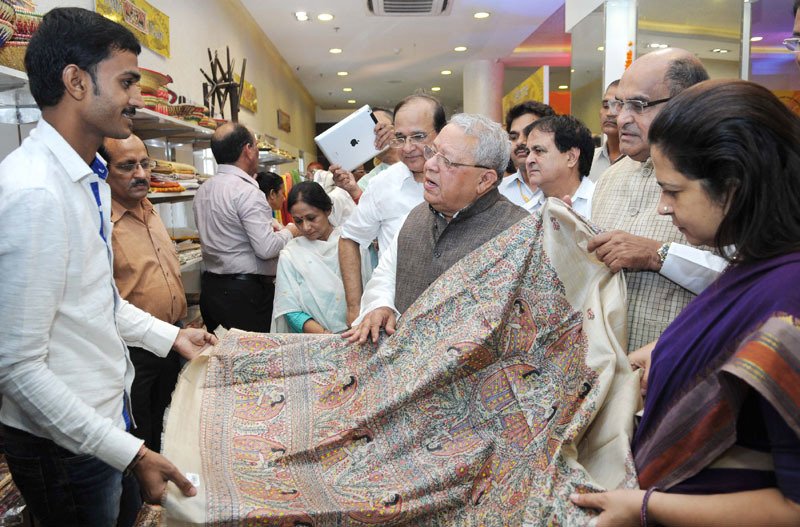 Shri Kalraj Mishra, Union Minister for MSME said that Khadi is the symbol of National unity and integration; hence every citizen should purchase Khadi. After inaugurating “Khadi Utsav” organized by Khadi Gramodyog Bhawan, on the occasion of Gandhi Jayanti, here today, the Minister said that Khadi is able to compete in today's global marketplace and to realize the vision of Gram Swaraj, it is necessary to develop Village industries. He emphasized that Khadi exhibitions should be organized in every district of the country. He also stated that the visionary Prime Minister is well aware the importance of Khadi, therefore he evocated to the people to purchase Khadi. Shri K. C. Tyagi, Chairman, DRPSC on Industry in his address congratulated everyone associated with Khadi Programme. He told that Ministry of MSME is competent enough to provide employment to lakhs of people. Smt. Meenakshi Lekhi, Hon’ble Member of Parliament congratulated everyone on Gandhi Jayanti and appealed to the people specially women to wear Khadi Saree. Shri Arun Kumar Jha, CEO and Commissioner KVIC told to media that the objective of “Khadi Utsav” is to revive the dormant Khadi production which was famous for its sophistication and fineness, as well as to rejuvenate various the artists, who are generally working as ‘Job Workers’ now. In the Exhibition which has been setup, the products comprising Khadi sarees, dress material and other ethnic products would be a delight for the connoisseur of fabrics and fine art. On this occasion a colorful Khadi Fashion Show was also organized by the Students of International design institute in association with designer of Khadi Gramodyog Bhavan KVIC, New Delhi. The Khadi Products directory was also released by the chief Guest on this occasion. The special discount on the sale of Khadi products shall also be offered to the customers on the occasion of ‘Gandhi Jayanti’. Dr. Anup K. Pujari, Secretary, MSME, Shri S.N. Tripathi, Development Commissioner, MSME, Shri B.H.Anil Kumar, Joint Secretary, MSME, senior officers of the Ministry and KVIC, representatives of Khadi institutions, entrepreneurs and representatives of Press & Media were also present at the occassion.